Today Anthony Watts (who runs a blog called WUWT) wrote about a new paper by Rignot et al to be published in Science *, and crowed triumphantly - see, it's not CO2 that's melting the ice shelves around the Antarctic continent, it's warmer sea water. He proclaimed it a game changer saying it made studies of surface temperature over the continent itself "even more irrelevant"! Now why would Anthony confuse land surface temperature across the huge continent of Antarctica with sea temperature around the edge of the continent? (Antarctica is a bit smaller than South America, larger than Europe and almost twice the size of Australia.) Is he that stupid or is he intentionally misleading his readers? It's an even bet with Anthony Watts. Not only that, but why would he think that warmer oceans around Antarctica are not related to global warming? Does he think oceans warm by magic? Or that global warming would not have an impact on ocean currents and atmospheric circulation? For WAIS, the culprit for the rapid thinning of ice shelves is increased delivery of warm ocean water to the base of the ice shelves. This isn’t due to a warming ocean (though the deep water off the Antarctic coast line is indeed warming), but to changes in the winds that have forced more circumpolar deep water onto the continental shelf. Circumpolar deep water, at about +2°C, is very hot compared with the in situ melting point of glacier ice. This article is a bit long and has some nice photos and images, so to save those of you who might have limited bandwidth, I've put the rest of the article below the jump. ...In some places, basal melt exceeds iceberg calving. In other places, the opposite is true. But in total, Antarctic ice shelves lost 2,921 trillion pounds (1,325 trillion kilograms) of ice per year in 2003-2008 through basal melt, while iceberg formation accounted for 2,400 trillion pounds (1,089 trillion kilograms) of mass loss each year. So not all the loss of ice shelves is through basal melt, it's just over half of it at 55%, which is still a lot more than previously thought. Calving accounts for the loss of the other 45%. Here is a really good illustration of the relative contribution from calving and basal melt at different locations. It's from the NASA press release. (Click to enlarge). 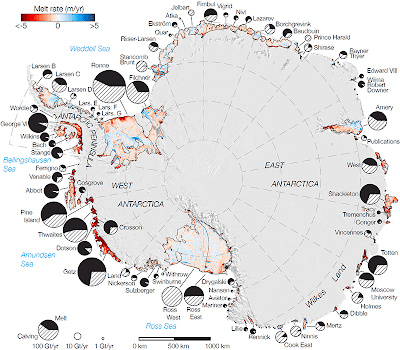 Map of Antarctica showing melting vs calving of ice shelves. Rates of basal melt of Antarctic ice shelves (melting of the shelves from underneath) overlaid on a 2009 mosaic of Antarctica created from data from NASA's Moderate Resolution Imaging Spectroradiometer (MODIS) instrument aboard NASA's Terra and Aqua spacecraft. Red shades denote melt rates of less than 5 meters (16.4 feet) per year (freezing conditions), while blue shades represent melt rates of greater than 5 meters (16.4 feet) per year (melting conditions). 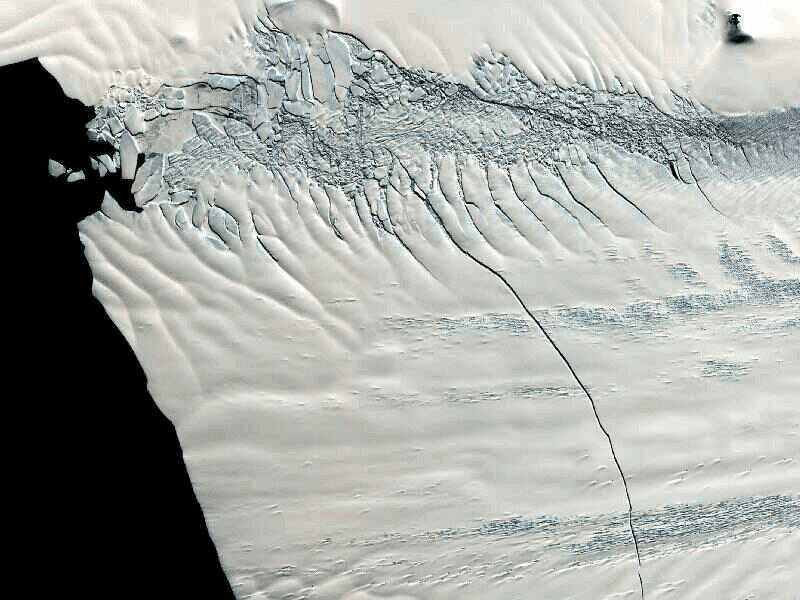 The perimeters of the ice shelves in 2007-2008, excluding ice rises and ice islands, are shown by thin black lines. Each circular graph is proportional in area to the total ice mass loss measured from each ice shelf, in gigatons per year, with the proportion of ice lost due to the calving of icebergs denoted by hatched lines and the proportion due to basal melting denoted in black. Basal melt does not dominate everywhere around the edge of the continent, it varies. The giant ice shelves of Ross, Filchner and Ronne, which together make up 2/3 of the ice shelf area, account for only 15% of basal melting. Half the (55%) basal melting is from fewer than a dozen small ice shelves that are floating on warmer waters and there is a similar rate of melt from ice shelves around East Antarctica. The rate loss of ice shelves is about twice the rate of loss of the Antarctic ice mass overall. In a number of places around Antarctica, ice shelves are melting faster than they are replenishing. The consequence is that glaciers on Antarctica proper and the entire continent is changing. Basal melt can affect ocean circulation more than calving. Melting means large quantities of fresh water is lighter near the coast line and it doesn't sink as readily as would colder saltier (more dense) water. This may have an impact on the ocean's overturning circulation. It can also drive coastal upwelling, bringing up nutrients from the deep ocean and causing persistent plankton blooms in summer. You can see more images and explanation here on the NASA website. There is a neat map where you can peel back the ice to see what lies beneath. As described on this NASA Earth Observatory website, ice shelves are important in butressing the larger ice sheets on land. When ice shelves disintegrate they don't cause much change in sea level themselves, because they float like any other sea ice. However when they disappear they allow the ice 'rivers' on land to flow into the ocean more quickly and raise sea levels. And sure enough, Bindschadler and his colleagues see an increased flow of ice off the land where the Larsen B shelf used to be. Even more disturbing is the fact that other Antarctic ice shelves are showing signs similar to the Larsen just before it collapsed. I did some digging on what is happening to ice over all of Antarctica. A paper by Sasgen et al (2012), indicates that on balance the Antarctic continent as a whole is losing ice. They also find that more than half the contribution to sea level (positive or negative) comes from only seven per cent of the area of the ice sheet - namely the northern Antarctic Peninsula (which is where Larsen A and Larsen B disintegrated) and the Amundsen Sea Sector of West Antarctica (the Pine Island glacier flows into the Amundsen Sea) (see map above). Here's a picture of the Pine Island Glacier showing the huge and growing crack across the middle of it. (Click image to enlarge). Pine Island Glacier with growing crack. Mass loss from the northern Antarctic Peninsula and the Amundsen Sea Sector amount to 151±9 Gt a year. This is not offset by the slightly positive mass balance, only 19±16 Gt a year in East Antarctica. East Antarctica exhibits a bipolar signature of accelerating mass increase in Dronning Maud Land and Enderby Land (basins 5, 6 and 7; 14±8 Gt yr−2) and accelerating mass loss in Wilkes Land and George V Land (basin 13 and 14; −5±7 Gt yr−2). Sasgen et al also observe that temporal change in East Antarctica and in Palmer Land on the Antarctic Peninsula is mainly due to interannual variability in accumulation. There was a lot more snow than normal in 2005 and 2007 in parts of East Antarctica, so the change in mass anomaly was from variability in large scale atmospheric circulation rather than from changes in ice-dynamic ﬂow. Whereas there is "increasingly vigorous ice flow" from northern Antarctic Peninsula and the Amundsen Sea sector, which will continue to add to the rise in sea level. This will not be the last word on the hot topic of Antarctic mass balance. June 13, 2013 at 5:24 pm uh, doesn’t this play into the theory of the camp saying that recent energy gains have been realized by ocean warming instead of atmospheric warming? June 13, 2013 at 5:25 pm So I guess the solution is to cut those evil CO2 emissions then? You know, that same CO2 that has been proven by satellites and weather balloons to have zero correlation with world temps? June 13, 2013 at 5:29 pm Any why exactly is the water warmer Anthony? June 13, 2013 at 5:33 pm So where did the warm water come from? You should be able to reverse the SST captures and trace the origins of that warm water. Most of the rest of the comments were from RWAs and Dismissives. Some were calling on magic fairy dust to explain observations. Others were in full on denial mode, while some were like Anthony Watts himself, and unaware of the scale of Antarctica or that surface temperatures on the continent are not the same as temperatures of the ocean under ice shelves. June 13, 2013 at 5:43 pm No actual measurements of either ice sheet melt by water or water temperatures. Their conclusion seems to be based purely on model outputs. June 13, 2013 at 5:45 pm OKkkkkkkkkkkkkkkk. Snow fall (and inland ice movement) are the sources of ice shelf mass? Didn’t these guys read about the Antarctic continent area is the driest in the world, with only a few cm of total precipitation a year? Where is this snow fall they claim? June 13, 2013 at 5:49 pm ...What ever the reason, it has nothing to do with atmospheric CO2. That would be like towing a semi-trailer with a moped. June 13, 2013 at 6:11 pm Most probably natural warming being taken up by natural melting, both in the arctic and the Antarctic. June 13, 2013 at 6:19 pm It just means that the models are wrong again. June 13, 2013 at 6:32 pm Steig et al modeled and extrapolated, they got it wrong. Will they recognize this? June 13, 2013 at 7:21 pm ...Ocean currents move around, that’s why...Global CO2 has nothing to do with polar ice — or else Antarctica would also be losing ice mass. 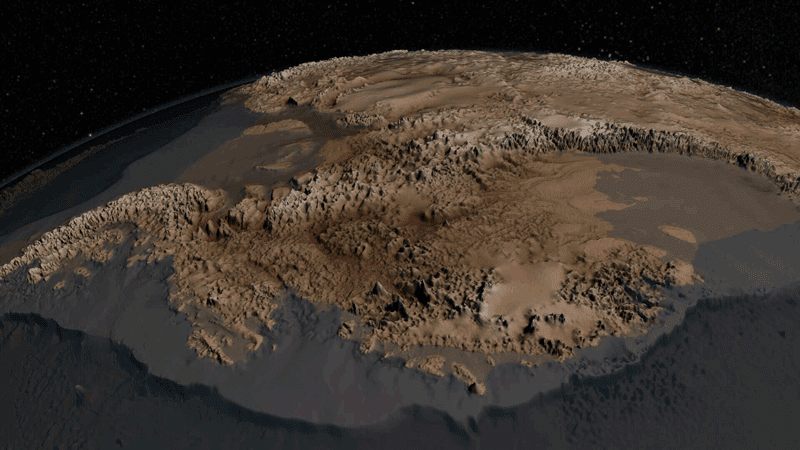 Instead, Antarctica is setting a new record for ice cover every year. June 13, 2013 at 7:36 pm But whatever it is, it definitely isn’t because of one more CO2 molecule per 10,000 molecules of dry air over the past 150 years. 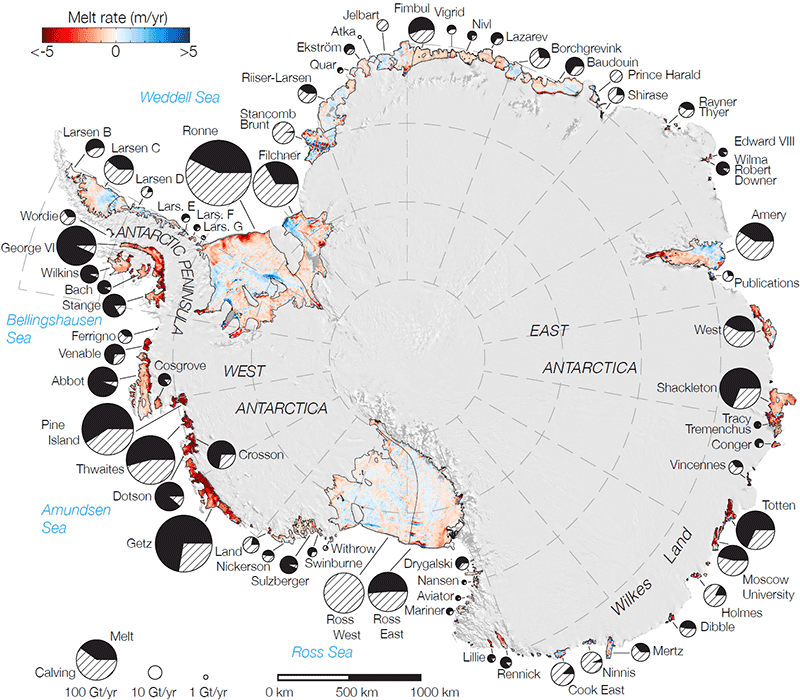 June 13, 2013 at 10:41 pm So Antarctic ice mass is decreasing, and the major contributor is warmer-than-before water circulating around it. Kevin Trenberth’s “missing heat” is melting the Antarctic ice (latent heat) instead of warming the surface and lower troposphere. Sounds like global warming to me. Others don't last very long at all before they are shown the door. Can't have too many people who accept science posting on WUWT. 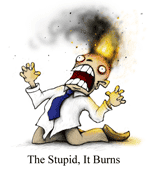 It upsets the denier rabble. Wow! I was wondering when someone was going to take on WUWT and it was very enjoyable to see. Keep up the good work! I expect two events will happen this year which will substantially change the tone at WUWT, (1)The Arctic will set new melt records and (2) Watt's last surface station study will be shown to be filled with sophmoric errors. People can only deny for so long before reality begins to take effect.